Making Scents. Arthur Yorinks, Braden Lamb & Shelli Paroline. 108 pages, First Second Books, 2017. First Second Books has been one of my favorite publishers for kids graphic novels for a long time now, and their ability to find talent and draw the best stories out of them is continuing on strong. 2017's Making Scents is a good example of a book that's ideal for kids in grades 3-5, telling a great story that is equal parts funny, weird, and unexpectedly sentimental. 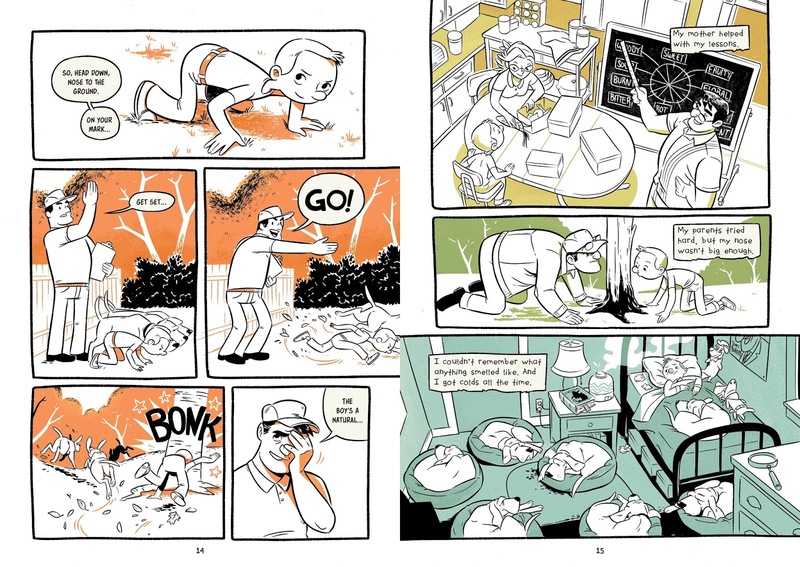 The book is about Mickey, a boy being raised alongside his parents' dogs. Mom and Dad have bloodhounds, which help police solve crimes. Mickey grows up with the dogs as siblings, and they're a big happy family; Mickey develops a keen sense of smell so he can play with and compete with his brothers and sisters. He spends a lot of time on all fours, he doesn't use utensils to eat...basically, he's a dog. After a tragedy, Mickey is sent to live with an aunt and uncle. The aunt and uncle don't like pets, so Mickey is separated again, this time from his siblings. He goes through the normal stages of grief, but is also trying to figure out who he is, and what he has to contribute to this new family. Can his unique sniffing talents be used to make his aunt and uncle happy? Can he share them with the kids at his new school? What is his place in the world? Mickey asks a lot of the same questions about himself that we all do, but Yorinks uses the (admittedly odd) device of the special smelling powers to help readers see things from a different angle. I love the artwork -- very retro, 1950s-style art. 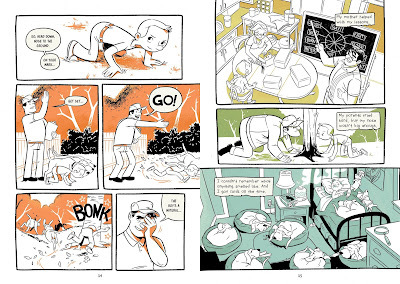 Streamlined, sparse backgrounds with cartoony characters, and only three colors per page. It works well for this story, which has elements of near-magic that might not work in a "realistic" setting. 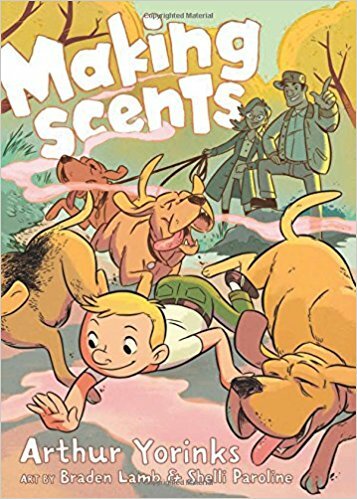 In all, Making Scents reminded me more of a Pixar movie than other books for young readers. The elements of comedy, adventure, and tragedy are all layered with a heartfelt ability to overcome grief, to find acceptance, to find love. It's a book I don't know that I would have picked up on my own, but I'm glad I did. Mickey uses his "powers" in several different ways in the story. At school, in games with friends, and for more serious things later in the book. How could he use those powers as an adult? What kind of job could he get that would let him use his talents to their fullest extent? Have students write a short story about what kind of workday Mickey would have as a grownup. Making Scents would be a good entry point for a unit on the senses, focusing in on the science of smelling. It's one that we use all the time, but it doesn't get all the top billing that say, sight or hearing get. If kids didn't have a sense of smell at all, what would their day be like? What do our noses tell us that our other senses don't? Some of my favorite parts of the book are with Mickey growing up alongside the dogs, and him behaving like a dog. Have students write a story about what it would be like to grow up with a different set of animals. What if the pets were cats? Birds? What if their parents raised giraffes? What if they grew up alongside a pride of lions? What kinds of skills would you learn from those animals? What would be fun? What would be difficult? What would it be like to go to school and behave like a "human" if you were raised that way?